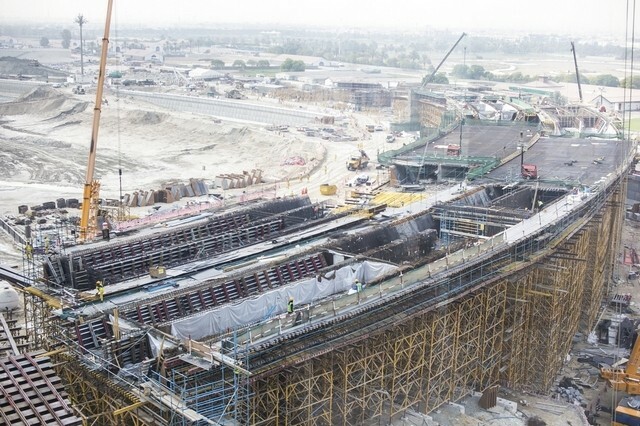 The Dubai Road and Transport Authority’s (RTA) unveiling of new designs for the Water Canal stops and a series of other transport projects this month is another sign that the local market continues to offer opportunities despite difficulties elsewhere in the region, according to contractors. A series of infrastructure projects being undertaken by the RTA include the new Shindagha Crossing, new dock areas for the Dubai Water Canal, new interchanges for the Jewel of the Creek project and the extension of Burj Khalifa metro station to boost capacity. The projects also feature transport plans for the city, including a traffic management plan that will include the installation of 36 extra bridges to boost traffic flows. Brendan Young, the head of rail for the Canadian engineering consultancy WSP Parsons Brinckerhoff in the Middle East, said that there are tenders that have been issued seeking consultancies to work on aspects of transport in Dubai. One is an update to the Dubai rail master plan, initially published four years ago. He said that the update was required to take into account changes that have taken place in the city since, such as development around Al Maktoum International Airport, Mohammed bin Rashid City and the Dubai Parks & Resorts site. It also needs to account for new technologies, such as automated vehicles like rapid transportation, especially in light of Vice President of the UAE and Ruler of Dubai Sheikh Mohammed bin Rashid’s decree that 25 per cent of all journeys should be made via smart and driverless vehicles by 2020. “What the RTA is doing is not just looking at 2020 but to 2030 and beyond to make sure that the public transport system is the best it can be for the users,” said Mr Young. A tender has been published for consultants to devise a new travel demand management strategy for Dubai, and a tender to create a master plan for a bus rapid transport system. Mr Young said that transport projects were helping to keep UAE contractors busy, especially as markets such as Saudi Arabia and Qatar are now much quieter than they were before the decline in oil prices. On Thursday, a report commissioned by The Big 5 construction trade show in Dubai from market researcher BNC stated that there are more than 3,700 projects across Dubai with a combined value of more than US$400 billion. “A growing population, the tourism sector, strategic government investments like the Dubai Plan 2021 and the Dubai Expo 2020 are fuelling the local construction industry,” Josine Heijmans, The Big 5 event director said in the report.